The past three Fed Chairs before Yellen all had their own crisis to deal with. Volcker had the disaster of the early 1980’s as he struggled to tame inflation with double digit interest rates. That helped contribute to the Latin American debt crisis, and the subsequent global bear markets in stocks. He handed over the reins to Greenspan in the summer of ‘87 and within months, the new Fed Chairman faced the largest stock market crash since the 1920’s. That trial by fire was invaluable for Greenspan, as he faced a second crisis when the DotCom bubble burst at the turn of the century. 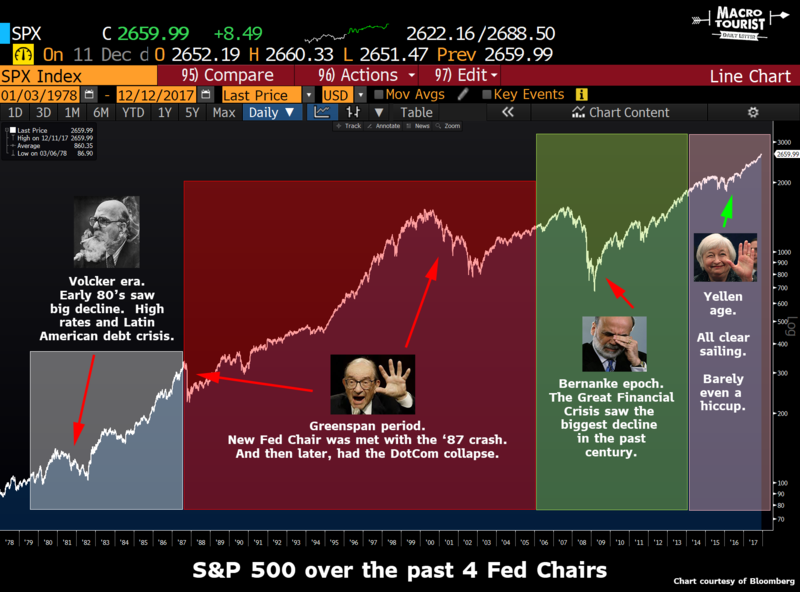 His successor, Ben Bernanke also did not escape without a record breaking financial panic when the real estate collapse hit the global economy especially hard in 2007. But Yellen? Nothing. Nada. She has presided over the least volatile, most steady, market rally of the past century. Was she lucky? Or was this the result of smart policy decisions? I tend to attribute it more to luck, but it’s tough to argue that she made any large mistakes. Sure you might quibble about the rate of interest rate increases. And her critics will argue that economic growth, and more importantly, wage increases have been especially anemic under her watch, but to a large degree, those variables are out of her hands. I don’t want to argue about Yellen’s legacy. Chances are your view is heavily influenced by your opinion about proper monetary policy. I doubt I could change your mind, but more importantly, it won’t help us decide where the markets are headed even one little bit. Yet the lack of a market crisis under her watch might play an important influence on the last meeting she chairs. Think about what she is leaving for Jerome Powell. It is quite clear that the ‘animal spirits’ have been ignited. All you need to do is look at the price of Bitcoin, or the last eleven months of gains in global stocks. Look closely at that chart. 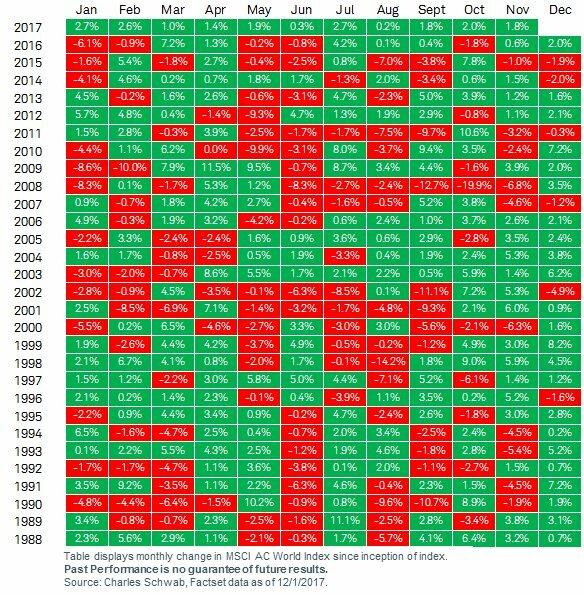 Try to find another year without a red month. 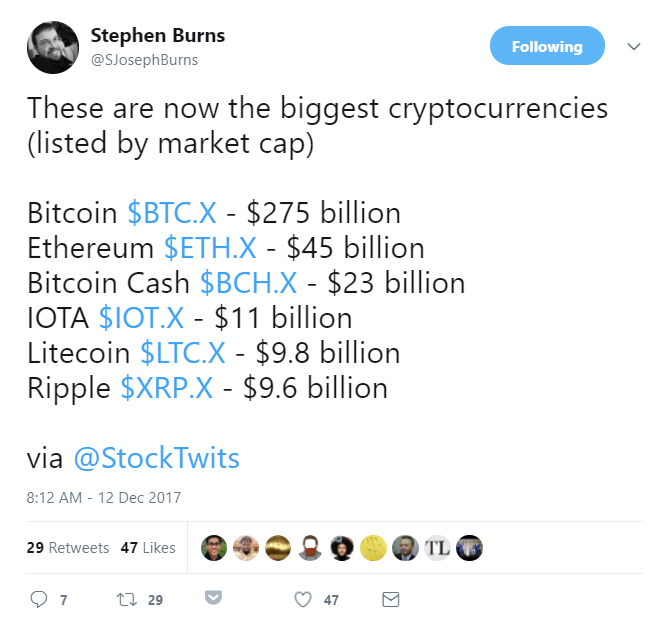 Or take a gander at the market capitalization of the various crypto currencies. Say what you want about the investing merits surrounding Bitcoin and all the other crypto currencies, but it’s safe to say that without the massive Central Bank science experiment of massive balance sheet expansion and negative rates, it would have been considerably more difficult for crypto currencies to reach this sort of popularity. Try blowing a crypto currency bubble with positive real rates. Tough. 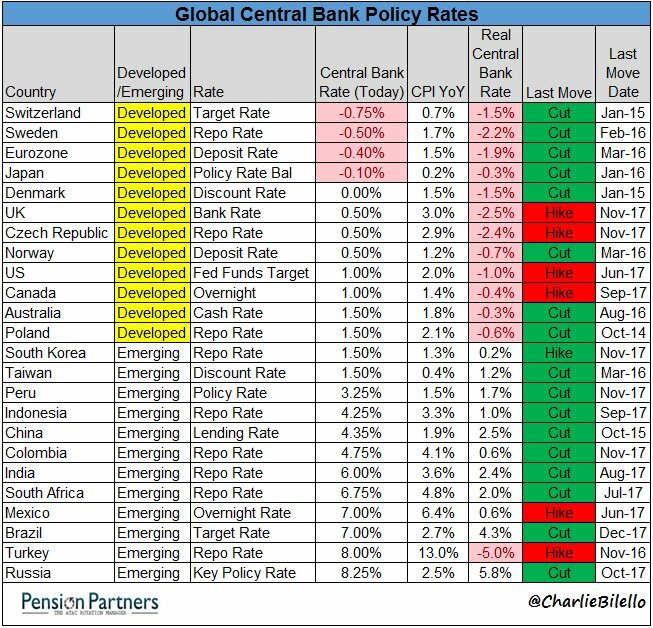 Try again with negative real rates throughout the world. Much easier. Look at the Developed Market countries. They all have a negative real Central Bank rate. Wonder why the public is clamouring for an alternative store of value? It’s because Central Bankers are engaging in offensive amounts of financial repression. I have this buddy who used to be a big time credit trader, but is now a semi-retired student of the markets. He is a massive crypto bull. Since way back when. And the reasons for his bullishness center around the absurdity of the amount of Central Bank printing. He has seen first hand the fragility of the financial system and is convinced we will be debased to oblivion. Ok, I might be paraphrasing a little. But here are a couple of blog posts he wrote on LinkedIn (yeah, I know, LinkedIn?) that go into his reasoning for owning cryptos - The Last Ten Years of Fiat Money Math and I am a Bitcoin Fan. Now I can’t bring myself to buy bits-in-the-sky because the Central Bankers are all insane, but I am sympathetic to his arguments that the end game is for all this to be debased. The reason I bring this up? This is Janet Yellen’s last press conference. Yeah, it appears as though she has made it through her term without causing an equity crash. But could it be that her legacy will be tarnished by presiding over the end of the public’s faith in Central Banks’ ability to preserve the value of money? Rightly or wrongly, we might be on the verge of a dramatic change in the global financial system. Given the environment, the most logical tack for Yellen is to err on hawkishness. She has a chance to give a final warning about the current exuberant attitude sweeping across the nation. Let’s face it, the Federal Reserve was practically begging the Federal Government to loosen the fiscal purse strings in the years following the Great Financial Crisis, yet the Tea Party made sequestration and other cuts a priority. Now, some eight years into a recovery, the Federal Government is aggressively cutting taxes and planning on making a big infrastructure spending push. The timing is terrible. The animal spirits have been roused, and it’s clear it’s the Federal Reserve’s job to tame them. Trouble is, the market does not believe the Fed has the guts to follow through with their projections. Have a look at the difference between market expectations of future Fed Funds policy versus the FOMC’s “infamous” dot plot. The purple line is the market’s expectation of Fed funds, while the green line is the FOMC’s median projection. The other day on Bloomberg TV, I heard a great explanation of the difference between these two series. A former Fed staffer argued that the FOMC projection represents the modal path, while the market is pricing a probability weighted mean. The market is worried about an accident causing the Fed to slash rates aggressively, and even if it is not probable, they still need to reflect this possibility in their pricing. 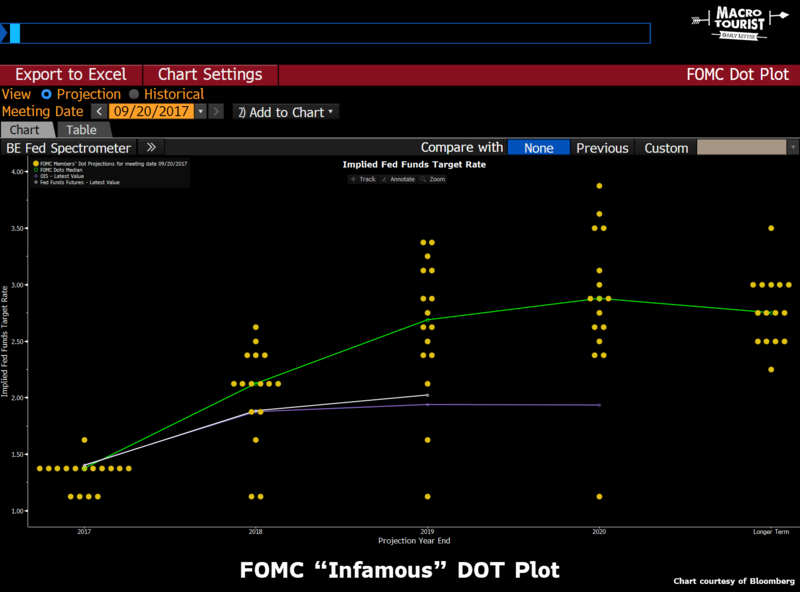 By that argument, it would seem that the Fed’s Dot Plot will always be higher than the market. But what about the alternative scenario? What if the Fed has to jack up rates because of inflation? Well, the market obviously doesn’t view that outcome as realistic. 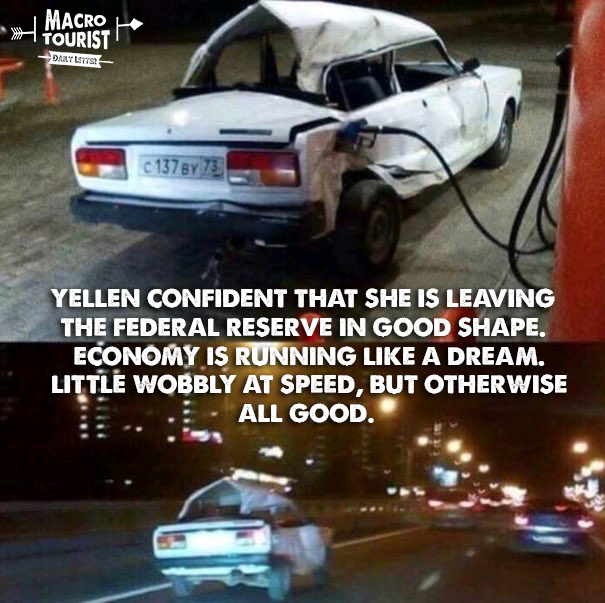 Back to Yellen. She is leaving, the markets are going bezerk. Put yourself in her shoes. You haven’t had even the slightest hint of a crisis under your watch. You are about to hand over the keys of the Federal Reserve. What would be the honourable thing to do? Delivering the most hawkish press conference one could reasonably deliver under the circumstances would be the correct course of action. Maybe the market will ignore you. But at least you tried. I know the markets are not at all concerned about tomorrow’s FOMC meeting, but I think there is a decent chance that Yellen & Co. end up erring with a significantly more hawkish statement than expected.